What is a Petition for Divorce? A petition for divorce, sometimes known as a dissolution petition or a petition for dissolution of marriage, is the initial form submitted to a court to begin the divorce process. It is the first official step to pursuing a divorce. In some jurisdictions, it is also known as a complaint. This petition will be filled out by one spouse and served to the other spouse. The individual filing the divorce is known as the petitioner or complainant. The person served is known as the respondent or defendant. Depending on the number of assets, amount of debt, the presence of minor children, whether both spouses want the divorce, and whether the spouses are willing to settle, the divorce process can take quite a bit of time. 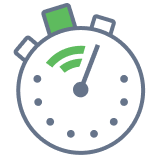 Every state has a certain minimum amount of time that a divorce will take, depending on whether there are minors involved. The petition for divorce, colloquially known as divorce papers, must include information about each spouse as well as minor any children they have together, when and where the two parties were married, an acknowledgement that the petitioner is a resident of the county where the divorce was filed and how long they’ve lived in the county, the reason for the divorce (including whether it is a no-fault divorce), and how the petitioner would like to split up the assets and debts, who will control the marital home and any vehicles, division of other property (which may depend on whether the state is a community property or separate property state and when the property was initially received, child custody and / or visitation of any minor (also known as parenting time), and other issues that often come up as a result of the divorce. The contact information for each party should also be listed. This will be needed in order to serve the spouse. You may or may not need to provide the phone number of the spouse being served. After the petition for divorce is finalized, both spouses are required to abide by the order of the court in regards to the division of assets and debts, custody and visitation of any minors, and other agreed upon stipulations or court orders signed off on by the judge. 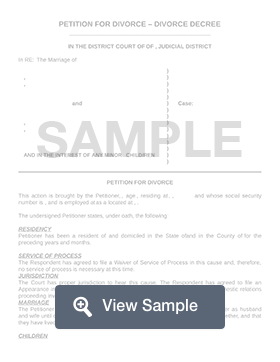 Create a free Petition for Divorce in minutes with our professional document builder. If you’re creating documents to file for divorce, it’s important that it contains the right elements. Otherwise, the court clerk can refuse to file the documents or the judge may refuse to assign a hearing date and time. Ultimately, the contents of a petition depends on where it is being filed and whether there are any children under the age of 18. So, while we are providing the following information, it’s important for you to understand that you should ensure that your petition contains the right information for your jurisdiction. The legal names and addresses of both spouses. The date and place that the spouses were married. Any minors belonging to both parties. Whether the petitioner has lived in the county long enough to become a resident so that they can file the petition. This also includes how long the petitioner has lived in the county. The grounds for divorce. Most states now have “irreconcilable differences” or “no fault” conditions. Some still allow divorces using a “fault” such as abandonment or adultery. However, if you choose to list a reason for the divorce, you must be prepared to prove it. Sometimes, it is easier to use irreconcilable differences or no fault even if you have a legitimate reason just because it’s faster and easier to put the issue behind you and move forward with your life. If there is domestic violence or a restraining order involved, that information should be mentioned in the petition. When a divorce is filed, you can request temporary orders. These are legal documents signed by the judge that says that spouses can or cannot do different things. For example, until a hearing takes place, a temporary order may state that the children live with one parent and the other parent receives visitation on certain days. It may also state that one spouse gets full access to the marital home and the other spouse does not. It may also determine whether one spouse must pay the other temporary support. Who will be fully or partially responsible for certain household bills and other financial obligations and concerns. Create the header. This generally reads IN THE DISTRICT COURT OF [COUNTY] OF [STATE]. Some states use other terms for the court other than “district,” such as "Supreme Court" or "Superior Court." Make sure that you have the proper name for the court that handles divorces in your state or county. You’ll use IN RE: The Marriage of [Petitioner’s Information] AND [Respondent’s Information] on the left side of the page. On the right, you’ll have a space for a case number that will be assigned by the clerk's office. For the petitioner’s and respondent’s information, you’ll need the full legal name and full address (including zip code) even if the parties still reside together. Next, you’ll need the age of the petitioner because the petitioner is the person filing for the divorce. Depending on your jurisdiction, you may also need to list the petitioner’s social security number or at least the last four of it. Next, you’ll list the job title and employer of the petitioner. This includes the address of the business. Now, you’ll list how long the petitioner has lived in the county where the divorce is being filed. This is done in years and months. For example, 5 years and 2 months. List the date that the parties were married and where the ceremony took place. You may also need to list the date that the parties stopped living together. List whether there are any children born or adopted into the marriage. Right now, it doesn’t matter if they are minor children. If the children are adults, you would state that the children are over the age of 18 or 21. List whether the wife is currently pregnant. For every minor child, you’ll list their name and date of birth. List the reason for the divorce. List whether the parties have entered into a signed separation agreement. If so, the date that it was signed should be listed. The agreement should be attached as an exhibit for the court. List whether the parties have a signed divorce settlement agreement. If so, the date that it was signed should be listed. A copy of the settlement agreement should be attached as an exhibit for the court. If there is a marital residence, lists who owns it. It may be owned by one spouse or both. List whether there is “divided interest” in the marital home and any other real estate owned by the spouses together. If yes, give the full address of each property. Tell the court whether the spouses have agreed to sell the property owned together and split the proceeds. Each party will need to complete a financial statement and turn it over to the court to show their income, expenses, assets, and liabilities. If the respondent consents to the divorce, the jurisdiction may allow them to waive their appearance. This is known as an uncontested divorce. However, you need to check with the court and determine what you’d need to do to include the proper language. This is generally done with an appearance waiver. List the date that the petitioner filed the divorce. Create and use a notary acknowledgement form that is signed in front of a notary. This should be done for both spouses if they both consent to the divorce and want to get it over with as quickly as possible by state law. Create a decree of divorce that basically contains all of the decisions made in how assets and debts are divided, who will keep possession of the marital home, and whether the wife will change her name. Support and custody are generally addressed in a marriage separation agreement or a divorce settlement agreement. The judge will sign off on this order. Divorce is a legal process that varies from state to state. As a result, there are several things you must keep in mind if you’re going to navigate the process without the help of a law firm. You will file the divorce with the district or state court that hears divorce cases for your county. Your petition must conform with the requirements for your county. You will also have to pay the court’s filing fee. Some states do have pauper’s affidavits for individuals with financial issues that make it hard for them to afford the fee. Because divorce is a legal process, the respondent must be legally served. Legal service methods vary from state to state, but you'll need to provide proof of service to the court. So you’ll have to look up the rules in your state about the service of process. Generally, service takes place in person. However, it’s rare that one spouse is allowed to (or should) serve the other spouse. Instead, service is generally done by a private process server or the sheriff. If you don’t know where your spouse has gone, you may have to serve them via publication. If that’s the case, the court has specific news or business news publications that you’re allowed to choose from to publish a divorce notice. It must run for a certain number of days and it is an additional expense you must pay. The other spouse has the legal right to file a response with the court. How much time they have to file their response depends on where the divorce is filed. It could be anything from about 15 days to 45 days. They may also ask the court for an extension to file their response at a later date. If no response is filed, the court may proceed and grant the divorce without ever hearing from the other spouse. Even if you choose to not use a divorce attorney, your spouse has the right to legal help from a family law attorney. You and your spouse may be ordered to mediation or settlement to try and work out the details of the divorce before the court signs off. Both spouses must be honest about their assets, income, liabilities, and their expenses. The court will use that information to decide if any agreed upon settlement is fair. The court will hear any matters that the two spouses cannot agree to settle.